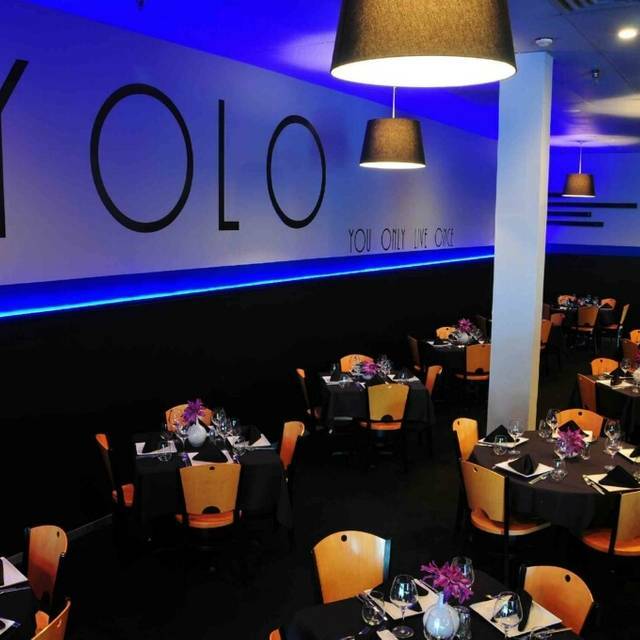 You must make reservations at least 5 minutes in advance of the time at YOLO Restaurant & Lounge. Yolo offers American cuisine set in a casual lounge setting. We believe in fresh healthy food, whatever your in the mood for we can offer it. If your looking for brunch, we have options every day of the week until 4pm. Join us for lunch, dinner, appetizers or drinks because remember You Only Live Once. The food was great overall. I think they should get some tips on calamari, the one in los olas Florida was delicious. We actually came there for the calamari thinking it was the same and was disappointed. The entree, and desserts were delicious though. Food was of good quality. Service lacked. Appitizers were brought out two at a time, a few minutes apart. Dinners were then brought out two at a time, several minutes apart. Awkward. One of the dinners was served on a plate that had 3 or 4 chips on the rim. Once the glaze is gone, that becomes the perfect breeding surface for bacteria. I had requested a San Pellegrino between courses, amd had to ask again when dinners arrived. We tried for restaurant week. Loved it! The appetizers were very good not much flavor, could not have been 4 oz. before cooking. Went to restaurant during restaurant week. Had a scallops appetizer, the scallops were outstanding! The entree was filet medallions Diane. The topping was delicious the filet was cooked medium it was the right temperature but it was very poor quality beef, it was chewy and stringy. We have dined at Yolo a number of times and always find it enjoyable. It is currently Local Restaurant Week and they had a nice selection of specials that included an appetizer for $20.19 which we didn't know about when we made the booking . All in our party ordered the twin 4 oz. Filet Mignon and paired with the Swiss Chard, Meatball or Scallops appetizer. Food was very good. Temperature was overdone a bit on a few of the filets but that is often the case when dealing with 4 oz portion. Had a nice meal at a great price. It was pleasant and enjoyable. The hostess who seated us offered a corner table upon request. Our server was a little brusque...but was hospitable enough. Menu was diverse and the risotto was very tasty. Haven’t been here in a while. Was extremely impressed with everything. The food was absolutely delicious. I have already recommended it to several people! Food was amazing, all staff was attentive and awesome considering how busy it was. Can’t wait to come again!! Nice bar. Great food and service. Easy parking. A neighborhood gem! We had a great dinner at YOLO. We made reservations for 615, and were pretty suprised how empty it was when we got there, but by 7pm it was a full house. Excellent service, great food and fun atmosphere. We felt like it was a little expensive for the serving size, but worth it for the quality and taste! We cant wait to go back! Can always expect great food, drinks and service! The atmosphere is nice---upscale but certainly not stuffy. Comfortable. And the food was quite good. There were several creative specials (I tried and totally enjoyed the breaded, fried dolmas). Also, I wanted the risotto but I need to eat lactose free. The chef accommodated my request, and the dish was absolutely amazing. I love it when a restaurant can adjust a dish for you--it tells me they care and that the food is fresh and prepared for each order, rather then prepared earlier that day and just waiting to be re-warmed when ordered. I can't wait to go back to YOLO! First visit to this restaurant. We definitely will be back! We enjoyed excellent grapefruit martinis at the bar before our dinner reservation. The bar staff was excellent at explaining beverage and food specials. It was half-price on all bottles of wine, with no corking fees. An excellent value. The filet and ciopinno entrees were excellent as were the Yolo and chopped salads. Our server was very attentive and our courses were served promptly, but in a very relaxed timeframe. We are never disappointed with the quality and value and expect to return often. The crab stuffed haddock over lemon rice was moist, flavorful and delicious! My appetizer was hot an amazing! My entree was room temperature, so that was disappointing but it was alright as the food tasted good. I would visit again! Cobb salad with substitutions for the meat was excellent! Fresh ingredients and eye-appealing presentation. Soothing atmosphere for lunch. We were there for Valentines Day dinner (one night later due to family events on the actual day) and YOLO didn’t disappoint us. The food was great, the ambiance was perfect. The service was awesome. And it was very refreshing to be able to have a conversation without having to shout at each other to be heard over the din. A great place for dinner with your significant other. The arancini was very good. I had the filet and shrimp. The filet was cooked perfectly and so were the shrimp. I could have used less of the cajun sauce but all in all very good meal. YOLO is our favorite neighborhood restaurant. We were able to share it with friends who enjoyed it as much as we do. You can never go wrong ordering a hamburger with fries. Their specials are always worth trying. 5 of our group of 6 LOVED their food, prices reasonable, great choices and fantastic service. Seated right away. Very cozy!! YOLO was great for food, ambiance and wine. our service was fantastic! Nice looking place and pleasant, attentive wait staff. Good bar choices. But the food was mediocre at best. Very accommodating on a busy holiday night, but food was overcooked and dry. Will try again! We’ve been to Yolo many times. The food is always outstanding. We love the atmosphere; great for any occasion. Interesting menu and good quality food. Good choice for a full dinner as well as just appetizers at the bar! High quality food and great service as usual. The Salmon Neptune and crab cakes were well prepared just as they were the last time I was here. The servers are always friendly. Food was good but service was poor. Seemed like most of the staff wasn’t enjoying their work. We had an excellent evening at YOLO. Great food and wonderful service. We’ll go back soon! You wouldn't think you would have such a great restaurant at an non-descript strip mall but you're missing something great. Really great service and even better food. Highly recommended. We'll be back often.